Known as malware 0-394-41525-6 to sysops, runners just refer to it as "bad times." With the arrival of new tagstorm deck archetypes in Data and Destiny, perhaps there will be some new value for this potentially rig-wiping card which has not seen a lot of love since there are many cheaper and generally more effective forms of tag punishment. The current pool of operation-based tag punishment includes meat damage (Scorched Earth and Traffic Accident), monetary damage (Closed Accounts), resource removal (Freelancer) and agenda acceleration (Psychographics). 0 influence. You may not want to go all-in spending all your influence on 3x Scorched. Wiping a program or two reactivates Cortex Lock. Many runners are prepared to counter meat damage; they may be less prepared to rebuild their rig (especially if Closed Accounts also lands) which opens up late-game scoring windows. I can only see this card being particularly effective if played twice in the same turn, perhaps via Archived Memories. However, the conspiracy breakers make it even less effective than it ever has been. I wish this card had been in Mala Tempora instead. Then we wouldn't have to worry about it anymore, and we could have some nice Latin jokes. But the fact is, here we are. 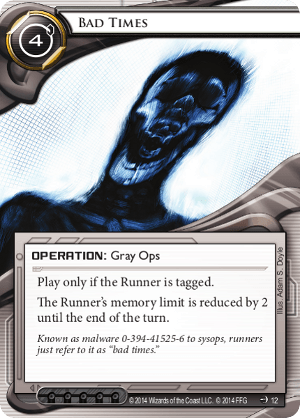 Bad Times (in Latin: mala tempora) is an overpriced, underwhelming operation that indirectly taxes the Runner by effectively taking up space on their rig. Much like the GOODTIMES virus of old, Bad Times presumably fills up as much memory as possible while emailing itself to all the Runner's friends. This squishy skull friend was obviously designed as a way for the Corp to bite back at the Runner, forcing them to discard valuable programs that took significant investment in and to install. ...or did it? The fact remains that the Runner chooses what they want to trash, and that's never a good thing for the Corp. You can bet those icebreakers giving you trouble aren't going in the bin - or absolutely are if they're the conspiracy breakers. At worst, you just sent Sahasrara, a dead Imp or Cache, maybe even Tapwrm to the bin. Runners have plenty of support programs that are easy come and easy go - a savvy Runner could even pop Self-modifying Code to free up one MU, tutoring another program along the way! Not to mention that the cost of this tag also includes the cost of tagging the Runner, which, as has been mentioned in other reviews, has a lot of other use cases. I mean, maybe if you were going up against tag-me Alice Merchant with God of War oh wait that's an AI and one ; you're fucked. tl;dr - even in this new meta, Bad Times are just... bad. There's just no getting around it. This isn't 46th card syndrome, it's 0th card syndrome. Leave it in the binder. Take it out of the binder. Eat it. There's so much wrong with this card. Its waaaaaaaaaay too expensive and waaaaaaaaaay too weak to be particularly effective. I mean, I get the idea of this card: tag a fool, trash programs because of it. Trashing programs is one of the corp's most impactful tricks, probably the second most after killing them. However, simply reducing the runner's MU limit isn't really the way to do that. Its pussyfooting around the issue without actually doing the deed. Had this card been a bit less expensive and just said "trash 2 programs" instead, this would've been killer, especially at 0 influence. So what's right? Just the concept and the artwork. Maybe I'm just a sucker for this kind of art, but I think its pretty cool.